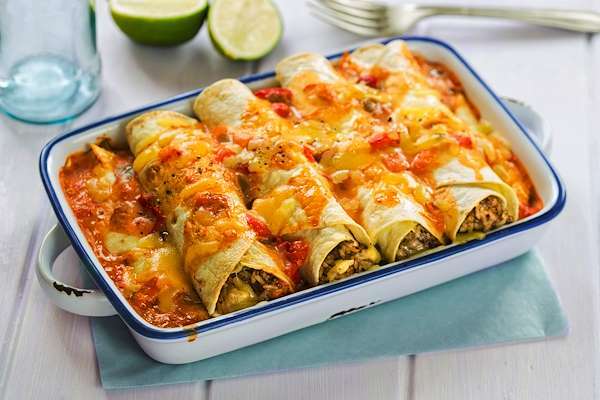 Intense and bold in flavor, these meaty enchiladas hit the spot. 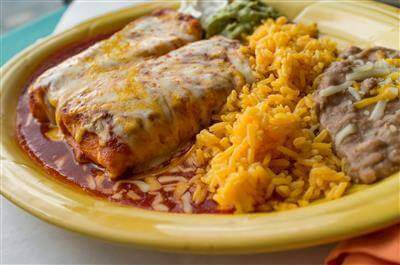 The meat is flavored with zesty Mexican-style herbs & spices and a gooey blanket of cheese. Top them with black beans and olives for yummy, authentic touch. RecipeSavants.com Intense and bold in flavor, these meaty enchiladas hit the spot. 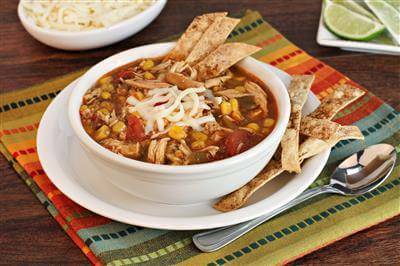 The meat is flavored with zesty Mexican-style herbs & spices and a gooey blanket of cheese. Top them with black beans and olives for yummy, authentic touch. Smart Recipes, Mexican Recipes, Beef Recipes, Recipes Beef Mexican Beef Enchiladas PT1H5M Serves 8 Ingredients: 2 Pounds Ground Beef 1 Medium Onion 1.25 Cups Shredded Cheddar Cheese 0.5 Cup Sour Cream 1 Tablespoon Dried Parsley 1 Tablespoon Taco Seasoning 1 Teaspoon Dried Oregano 0.5 Teaspoon Freshlyground Black Pepper 2.5 Cups Enchilada Sauce 1.5 Teaspoons Chili Powder 1 Clove Garlic 0.5 Teaspoon Salt 8 Flour Tortillas 15 Ounces Black Beans 4 Ounces Sliced Black Olives Preheat oven to 350 degrees. In a large skillet over medium-high heat, saute beef and onion until browned, about 10 minutes, stirring occasionally. Drain grease from skillet. Add sour cream, 1 cup of cheddar cheese, parsley, oregano, taco seasoning and black pepper and stir until cheese is melted. Stir in enchilada sauce, garlic, chili powder and salt and bring to a gentle boil. Reduce heat to low and simmer for about 5 minutes. 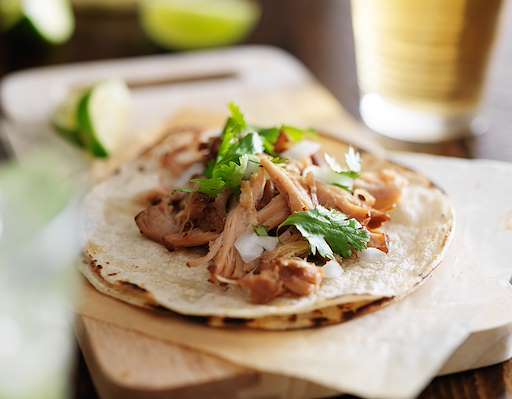 Arrange tortillas on a smooth surface. Place about 1/4 cup of beef mixture in the center of each tortilla, followed by 1 tablespoon of black beans and black olives. Roll each tortilla like burritos. Arrange tortillas in a 9x13-inch baking dish, seam-side down. Place any remaining beef mixture over enchiladas, followed by any remaining black beans and olives. Sprinkle with remaining 1/4 cup of cheddar cheese. Bake for about 20-22 minutes. Remove from oven and cool for about 5 minutes before serving. If you enjoyed this Mexican-inspired dish, try these zesty ideas! This classic Mexican burrito with beef and cheese recipe is even better than takeout and just as speedy. Fully loaded with cooked beef, beans, cheese and fresh salsa makes them healthier too. 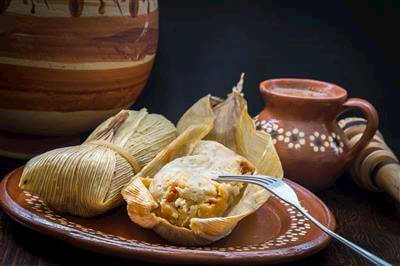 These tamales are juicy and delicious with a healthy portion of saucy and seasoned chicken wrapped inside a traditional masa dough. Serve with a side of Mexican Rice and Charro beans, with a healthy dollop of our classic tomatillo cilantro sauce.